I spotted a couple of the Nicole by OPI holiday polishes at Meijer recently, but they were laying all by themselves on a shelf, so I'm not sure what type of display to tell you to look for! 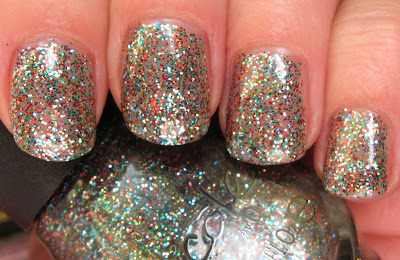 Bring on the Tinsel is filled with tiny multi colored glitter in a clear base. 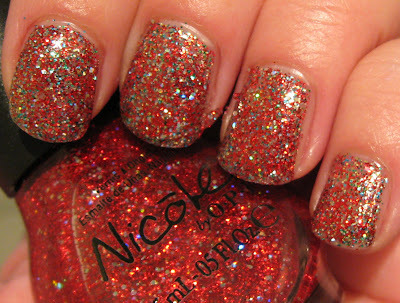 The silver, red, blue, and green glitter combine to remind me of Christmas lights, making this perfect for the holidays. Above & Below: The top photo was taken outdoors, while the ones below were taken with an Ott lamp. I only used 2 coats and all in all, I'd say I had good coverage with a fairly even application. Three coats would be ideal, or it could easily be used as a top coat over another shade. Like many clear based glitters, the formula has a somewhat jelly texture, but it dried quickly. Below: Before I removed Bring on the Tinsel, I added one quick coat of the other Nicole shade I picked up, Spark My Mistletoe. This is poor lighting, but if that look doesn't say Happy Holidays, I don't know what does! 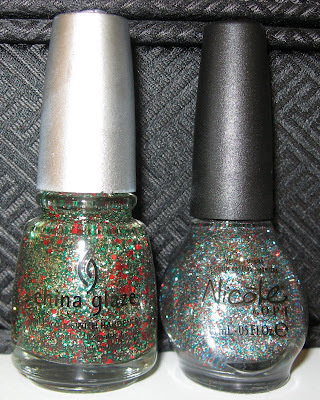 Below: If you're wondering how the Nicole compares with another holiday favorite this year, China Glaze Party Hearty, here's a bottle comparison showing just how different they are. 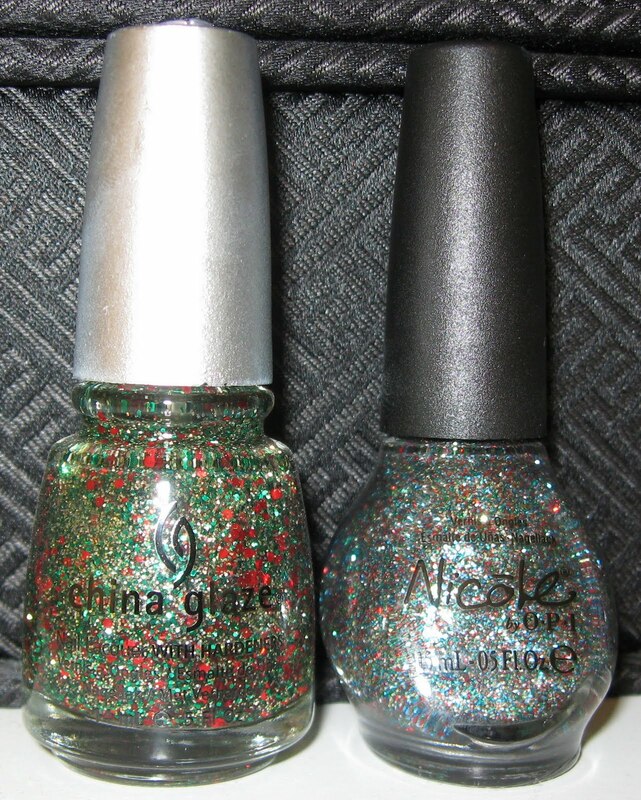 The Nicole is more blue with finer glitter, while the China Glaze has more green in it, as well as a variety of sizes and shapes for the glitter. 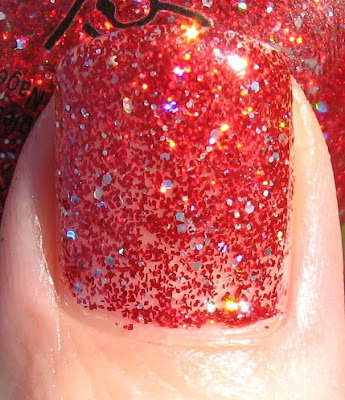 Below: Spark My Mistletoe is shown here using 2 coats over China Glaze Frosty. 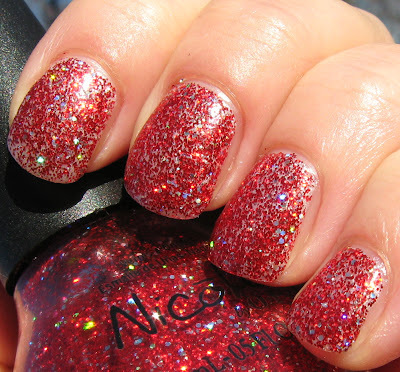 This primarily red glitter with secondary multi colored larger glitter seems to have a bit of a foil finish, making it another festive shade for the upcoming holidays. Below: This shows two coats by itself, and I think when I use this the next time, I'll use it alone and go with 3 coats. 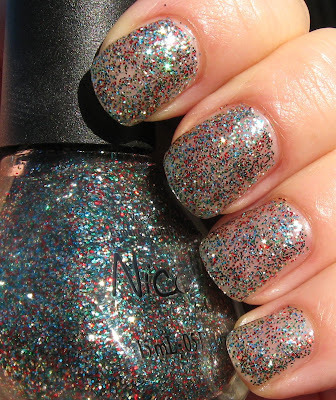 Below: In lower lighting, the multi colored glitter becomes more obvious. 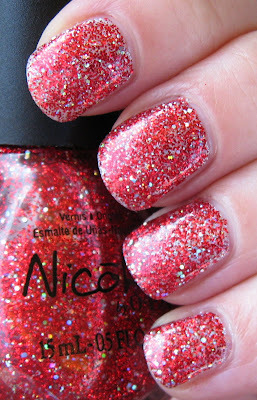 Even though I'm not a fan of Nicole's bottle shape, I do think they come out with some beautiful shades, and these holiday polishes are a good example. Have you seen these in a display? I'm wondering if any of the other shades are worth hunting down! Let me know your thoughts if you've come across these yet. bring on the tinsel is nice. i wonder what these two would look like with party hearty layered on top..
Love these polishes. 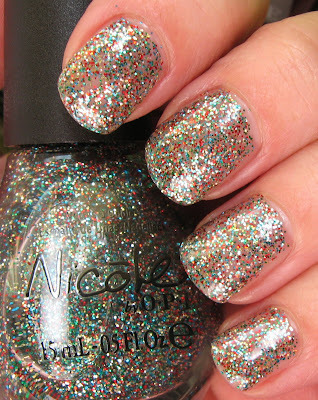 I only have 1 Nicole polish that I found at the Dollar Store. I'll have to pick these up. These holiday shades are killing me! I love them all! hmm i'm not diggen any of these. my wallet is safe! my leetle nails~Party Hearty is pretty, no doubt about it. I hope you'll be able to find it at some point! Amanda~that would be a major glitterfest! I'm sure it would be very blingy and beautiful though :) And probably not too fun to remove! Zara~you'll get it one day! kittypolishnbags~glad you enjoy them! I'll probably tire of them by Christmas, but for now, I'm loving them too. kelliegonzo~that's always a good feeling too! They're pretty, but not 'must haves'. Especially if you have some of the similarly holiday themed glitters that seem to be out in full force this year!